Filed under higher-education on July 14, 2013. This month marks my first year as the chief academic officer, Vice Chancellor of Academic Affairs (VCAA), for the Columbus/Franklin region of Ivy Tech Community College. During this first year, I have learned much about my new role, the college and the community. To celebrate my first year, I’ve decided to share some lessons learned. These lessons may (I write “may” because every situation is unique) be useful for new and even seasoned chief academic officers. Blogging/writing is a great way for me to reflect on this past year and my hope is that not only will these lessons be of value to others when shared, but it will also force me to spend additional time reflecting on the past year’s hits and misses. I understand no one will read the entirety of my lessons at a single setting (heck, I don’t think there will be many people who will read a single lesson), so I will spread them out over a series of posts. I will do my best to get each lesson out there as soon as I can. I’ll also leave the comments section open for each post so readers (again, if any) can ask questions or even drop in your own experiences. It’s a short lesson that is hinted at in the image above. I remember thinking, while reviewing the position description for the vacant VCAA in Columbus, “I can do that. It’s just an extension of my current role.” I was correct to a point. Sure I continue to manage these same tasks; however, the complexity of each is multiplied exponentially as the chief academic officer. So while both positions are similar in scope, they differ on scale. It’s the scale that can cause you to be out of touch with what is happening. As a dean, I felt as if I knew what was going on in the classroom. I understood faculty issues. I knew students and faculty by name. Now I often find myself asking, “what’s happening in our classrooms?” or “who is that faculty member?” There’s a level of disconnect from the faculty and students that I was not prepared for nor have I been able to easily correct. I was a faculty member for twenty years and even though I still hold my rank as Professor, I have not had the opportunity to teach during this past year. Being out of the classroom is a void that needs to be filled at some point. Not knowing the name of a faculty member became an issue early on. During my first year I was accused of not saying “hello” to a faculty member at a public event. Quite honestly, I had only been in the position for two months and probably had not met the faculty member, or if I had, only once; however, that was not the expectation. Lesson learned! I can do something about that. So I grabbed a visual directory from our marketing folks and began studying it. Faculty who avoided me found an appointment in my office for a one-on-one. Those one-on-one meetings are extremely valuable. I did this as a dean and am flummoxed that I am only now realizing that I need to do this as a VCAA. I’ve learned that many of those ideas I thought I would implement “if only I were the VCAA” were not feasible. Ivy Tech Community College is a state-wide system of campuses. While we have some regional autonomy, there are many statewide policy decisions that as an officer of the college I am required to enforce. The line between my regional role and my requirement to maintain our statewide curriculum and policy is thin - razor thin at times. The nice part about my current position is that if I disagree with a policy (which I often do), my voice is now heard. This is the first time in my higher education career that I have had that feeling. That doesn’t mean I can’t make regional changes though. One simple, but well received, change was to decrease the number of meetings for faculty. I want our faculty to have more time for their students and their craft. I have been to many a faculty meeting that was not productive nor a good use of my time. I didn’t want this for our faculty so I decided I would not prepare an annual faculty meeting schedule. We have no regularly scheduled faculty meetings, save for our very first meeting at the beginning of the semester. Meetings fall on our calendars only when we need them and only with the faculty who need to be there. When meetings do occur, they are well attended, productive, honest and open. One of my favorite compliments received this year was from a faculty member who said, “I like your meetings…I like your no B.S. style” – in other words they were telling me to not be a politician, but to be honest and make meetings useful. I can honestly say that I am much better at this as a VCAA than I was as a dean, but I still have a bit of work to do as we will see in a later post. 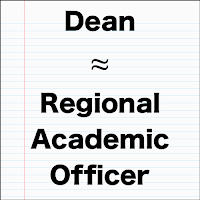 That does it for my first post where I discuss the cursory differences between being a dean and a regional academic officer. As is true with most of my writing, this isn’t a deep look into the nuances, but just a couple of quick thoughts. Be on the look out in the near future for the second lesson in the series and in the meantime, as I mentioned earlier, feel free to drop your comments below. I look forward to reading them.